• Intuitive visual feedback for fluid DJ workflow Mad Zach rocks the new TRAKTOR KONTROL S4 and S2 Getting started with TRAKTOR KONTROL S4 / S2 and TRAKTOR DJ ESSENTIAL TRAKTOR KONTROL TRAKTOR KONTROL S2 is the no-compromise 2-deck DJ system. 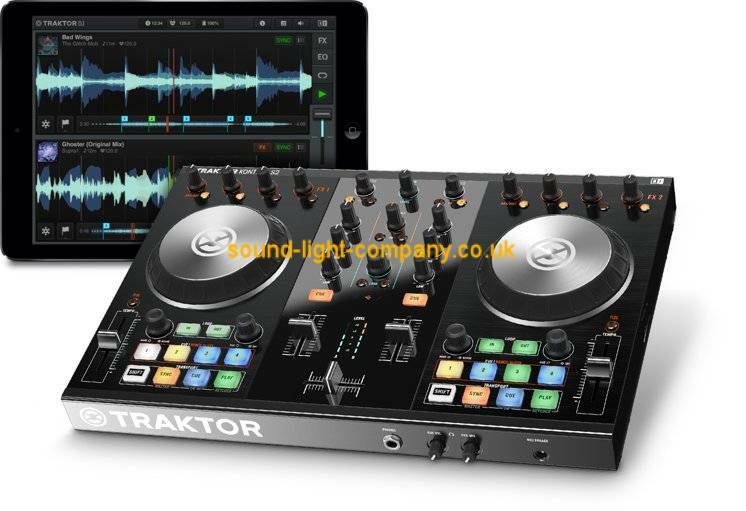 Fully integrated with TRAKTOR DJ for iPad and iPhone - add tactile, physical control to your iOS DJ setup. DIVE INTO THE MIX Compact, mobile, and intuitive - the TRAKTOR KONTROL S2 is the essential 2-deck professional DJ controller. Perform with two channels, a pro-grade mixer and an arsenal of specialized DJ effects at your command. Or use your own samples to personalize your sound with Remix Decks. Fine-tuned for essential TRAKTOR PRO 2 control, TRAKTOR KONTROL S2 also pairs with TRAKTOR DJ for iPad and iPhone as the cornerstone of your mobile DJ setup. TRAKTOR PRO 2 SOFTWARE TRAKTOR PRO 2 is the choice DJ software of countless professionals worldwide. Get in-depth control of your music with up to four software decks, customizable interface, and advanced track library management. Sync tracks to one another for flawless beatmatching. Or unleash your creativity - TRAKTOR PRO 2 comes armed with a spectacular creative arsenal and absolute flexibility. INTUITIVE HARDWARE The hardware is compact and focused, offering easy access to all essential TRAKTOR features. Sturdy knobs, precision jog wheels, and RGB backlit buttons keep you in control even in the darkest clubs. Rugged and portable, TRAKTOR KONTROL S2 is ideal for both new and seasoned DJs. THE PRESS ON TRAKTOR KONTROL S2 "The Traktor Kontrol S2 MK2 just got significantly better for the same price." DJ TechTools "A very capable and compact unit that we will recommend to any professional DJ who wants a small but powerful Traktor Pro controller." DJ Booth "I really can't recommend the Traktor Kontrol S2 enough." DJWorx WIDE WORLD OF TRAKTOR Explore the wide range of cutting-edge, professional DJ hardware and software that is TRAKTOR.